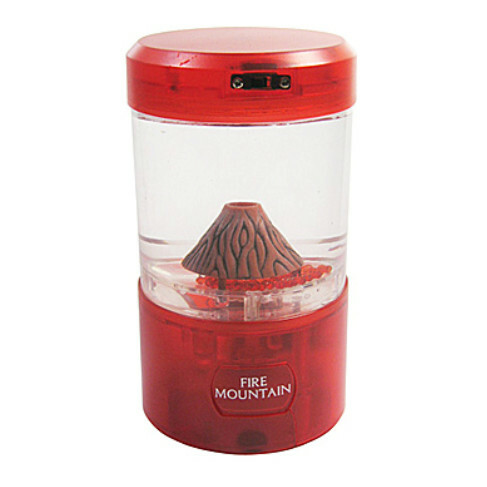 This is a RED Mini Volcano display. Fiery eruptions on a miniature scale -- The dynamics of bringing earth, fire and water together are reflected in this amazing, kinetic sculpture. The perfect conversation piece for the home, office, or dorm room, let this small lava light of the future softly light up your space. Desk accessory erupts with red beads to simulate a volcano! Red LED lighting system transfixes viewers! Adorn your desk with an accessory sure to inspire awe and delight from your co-workers. The Mini Volcano uses kinetic energy to send multi-colored beads erupting again and again. Hypnotic soft lights enhance the eruptions in multi-chromatic patterns. Bejeweled lava continuously erupts from the Mini Volcano, creating an astonishing visual display. Just add water and a couple of drops of liquid dish washing detergent. Press the button to activate the volcano and changing light effects.